Photo: Nishi no Seki Junmai, made from Hattan Nishiki rice at 60% seimai buai. Last chance at the Takara corral to unholster the six sakes John Gauntner chose for the evening. Last sips of life in Japan. Doreen, a veteran of 35 years in Japan and a part-time NHK sumo announcer, presides over the table in her plummy British accent. Patricia, my familiar drinking buddy, and I relax into tipsy companionship. John talks about sakamai (sake rice) varieties. He plants images in my mind of tall stalks straining to stay upright. After harvest, the toji (brew master) coaxes the extra-large rice grains to dissolve and ferment with the yeast and mold. 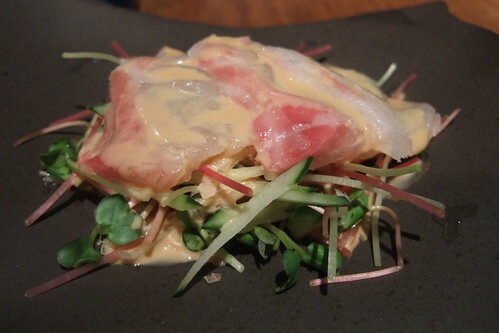 Photo: Sea bream salad with miso dressing, cucumber, and mixed sprouts. Rob Yellin gives a lecture about chawan (tea bowls). He instructs us to take off our jewelry when handling the irreplaceable bowls at the head table. We look for spontaneity in the carving of the bowl’s foot, for the irregular beauty that holds one’s interest so much longer than perfect machine-made soulless crockery. Refills of favorites and I am pain-free. Some of the gang of ex-pats pity me for having to leave Japan. I feel a mixture of envy that they get to stay in Japan and a primal urge to go home. I gotta see about a house and a job and the rest of my life. But this life is so very very tasty. 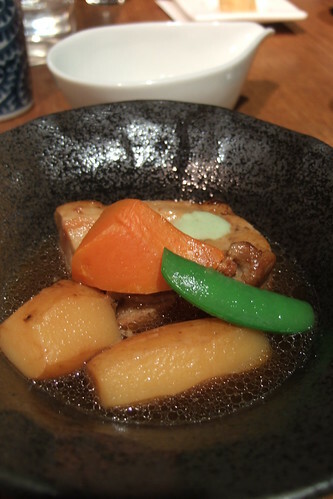 Photo: Pork belly braise with carrots, snap peas, and potatoes. Six dinner courses, six sakes, a few hours of varied pleasure. Kaika Junmai Nama (Gohyakumangoku rice) had a deep floral nose, almost like a chrysanthemum, with a fat body and a long sweet finish. Nishi no Seki Junmai (Hattan Nishiki rice) was crisp with high alcohol, and a tight, clean, almost wheaty taste that faded quickly. Dewazakura Ginjo (Dewasansan rice) had a spice nose with a hint of peppermint, a light body, and a fruit aftertaste, almost effervescent on the tongue. 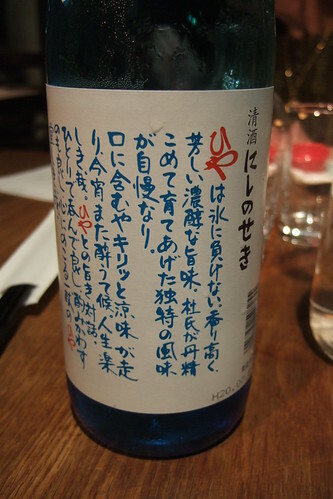 Toyo Bijin Junmai Ginjo (Akaiwa Omachi rice) was delicate and elegant with a silky texture. 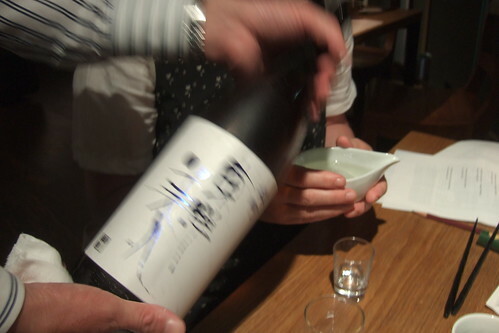 Hitakami Junmai (Yamada Nishiki rice) was clean and fresh with a black pepper edge, a tidy sake. 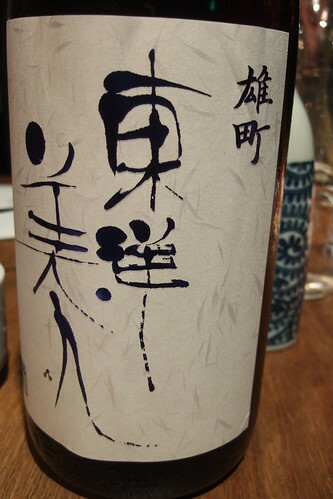 Hitakami Junmai Ginjo (Watabibune rice) had a rose nose, but the taste was wide, strong, and bold. Photo: Toyo Bijin Junmai, made from Akaiwa Omachi rice at 50% seimai buai. Goodnight junmai and ginjo and nama. Goodnight sake bar and Mori-san the sommelier. Goodnight John, goodnight Rob, goodnight Patricia. Goodnight cultural inebriation. Goodnight nihonshu in Japan. A new challenge for Madam . . . to do for Virginia wines and wineries what she has done so nobly — and with such abnegation and self denial — for Japanese saki y saki producers. Madam. I throw down the gauntlet! Madam says: I always welcome a chance to taste something delicious, no matter where it comes from. Madam, I envy your saki exploits. Back when I was still running restaurants, I did a crash course in saki – two hours of instruction and 6 hours of tasting about 300 bottlings. However, it is so hard to find good saki in this area. I advise you to bring back as much as the law will allow.